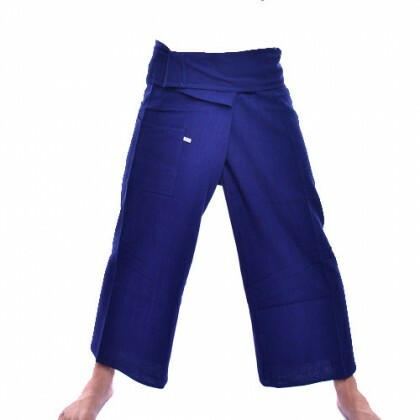 Blue Fisherman Pants - 100% Cotton - Traditional Thai Pants! Slide into these blue fisherman pants & Liberate your Legs! Easy, breezy, comfy, cotton pants. These blue fisherman pants are the most comfortable pants you will ever own. Make the lifestyle choice to upgrade shorts,slacks and jeans to the legendary comfort of fisherman pants and transport your legs to a new breezy, cool, relaxed dimension. Stay cool and feel funky in all weather conditions. One of the great treasures you can only find in Thailand, these traditional Thai fisherman pants are lightweight wrap pants perfect for men and women! They are "free size" (one size fits all) and there is a drawstring to fasten the pants with. Each pair is fully adjustable to fit a wide range of body shapes and size.